President Maithripala Sirisena speaking to a student. Picture by President’s Media. 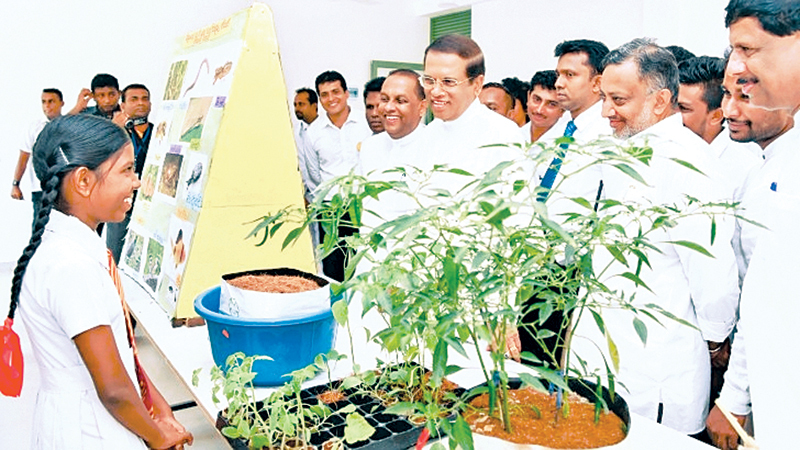 President Maithripala Sirisena said the education syllabus must teach not only how to pass examinations but also show how to lead a contented life. He was speaking at the Kotawaya Maha Vidyalaya in Hambantota where he vested the newly constructed two-storey building and the new technology laboratory with the students on Monday. The President also undertook a visit of the school and spoke to the students. President Sirisena said although free education created many scholars and intellectuals, the knowledge of how to lead a contented life is limited. He said intellectuals should lead a campaign to stop ragging in universities. Teachers and parents too must be vigilant of brutal ragging. Changes will be made in the education system to ensure that children learn how to succeed in life in addition to passing examinations. Minister Mahinda Amaraweera, Deputy Minister Lasantha Alagiyawanna, Southern Provincial Minister Chandima Rasaputhra, H. W. Gunasena, principal of the school, teachers, staff members, pupils, past pupils and parents were present.